Air passenger traffic in India surged by a whopping 28.1 per cent in July, the highest among eight major international markets including China, Russia, Brazil and the US, owing to addition of new services and improvement in domestic economy, an IATA report said on Friday. The overall domestic travel demand worldwide rose by 7.6 per cent in July this year as against 6.5 per cent in July 2014, with all markets showing growth and the strongest increases occurring in India and China, International Air Transport Association (IATA) today said. China clocked the second highest growth at 10.9 per cent after India followed by the Russian Federation, which posted an 8.8 per cent growth during the period, it said. The US and Brazil markets grew by 6.6 per cent and 5.9 per cent in July 2015, IATA said. "India's domestic demand soared 28.1 per cent in July compared to a year ago, likely owing to significant increases in service frequencies and improvements in economic growth. 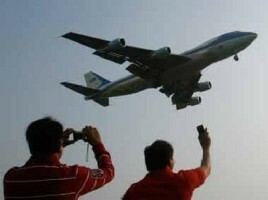 "China domestic traffic climbed 10.9 per cent year-on-year. Recent developments in the Chinese economy, including deep declines in the country's stock exchange, have increased concerns about a further slowdown in the economy," IATA said. "July results were strongly positive but slowing global trade and the wild gyrations of stock exchanges around the globe suggest that we may be in for some turbulence in coming months," IATA Director General and Chief Executive Tony Tyler said. According to the global airlines body, results were given a boost by the timing of Ramzan which fell partly in July this year but took place mostly in July in 2014. The holy month of Muslims tends to subdue demand for air travel. Domestic capacity across the eight global markets climbed 6.5 per cent while the seat factor grew by 0.8 percentage points to 83.6 per cent during this period, IATA said.